Once a week, I roast a chicken. 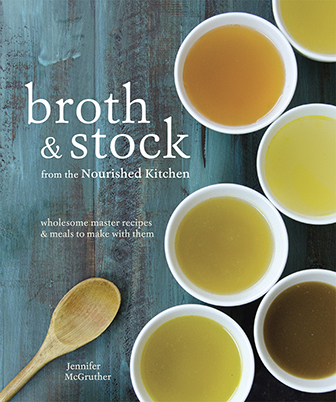 I stretch what I can into several meals, and I throw the chicken’s frame into a slowcooker for perpetual broth all week long. 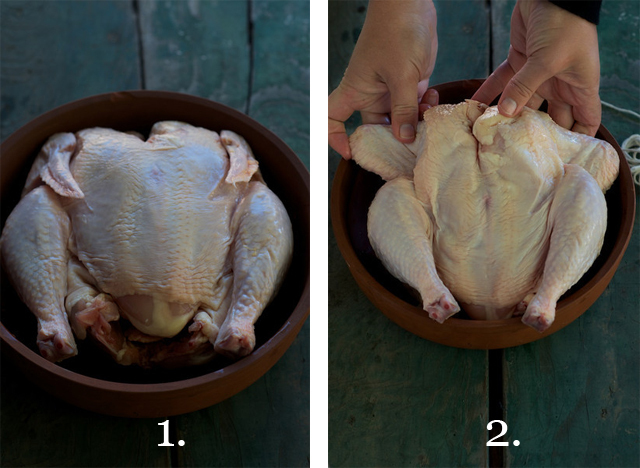 Trussing the bird first, before roasting, helps to ensure that the chicken cooks evenly, and that its breast meat remains moist and not dried out, which can be a problem in preparing pasture-raised, free-ranged and slow-roasted birds. You can use the same trussing technique I use for chickens to truss ducks, geese, turkeys or other poultry. 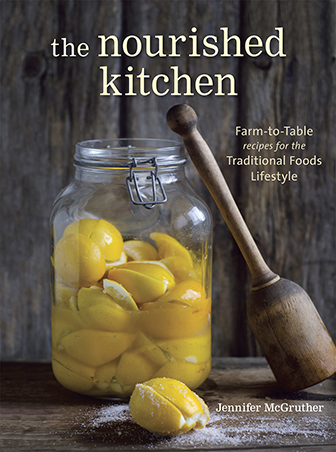 With Thanksgiving looming in just a few short weeks (speaking of which – have you checked out our online cooking workshop ALL about real food for the holidays? It’s on sale this month! ), I wanted to share this simple, practical technique with you. It will result in more moist, evenly cooked birds and is a cinch in just six easy steps. Rinse the bird in a gentle stream of water both inside and out. Pat it dry, and set the chicken in a baking dish. 2. Tuck the wings behind the bird’s back. Grasp the bird’s wings and tuck them behind the bird’s back. 3. Wrap the legs together at the ankle. Take a few feet of 100% cotton cooking twine (available here), and arrange the birds’ legs at the center of the length of twine. Wrap the twine around the birds’ legs at the ankle twice. 4. Bring the twine over the legs, to the back. Next, take both ends of the twine up in your hands and string them over the bird where its thighs meet its breast, and over where its wings meet its body to its neck. 5. Crisscross the twine on the bird’s back. Flip the bird onto its breast, and crisscross the twine along its back. Flip the bird onto its back once more. 6. Bring the twine back to the legs, and tie it off at the ankles. Bring the twine down to the birds ankles again, and tie the twine. Roast the bird according to recipe directions for Easy Roast Chicken or Savory-Roasted Chicken with Lemon, Garlic and Potatoes. Can you recommend a crock pot to buy,….or at least the features that are important? Have you seen the trick Tim Ferriss uses in 4-hour chef? He cuts holes in the skin flaps around the groin and tucks each leg into the opposite flap. No string needed! I’m going to have to look that up! I eliminate this need when processing the birds, by leaving the band of skin to tuck the legs into. Just make the evisceration cut sidewise, and leave the band of skin between the (removed) vent and evisceration cut and – voila`, just like store bought turkeys. Also makes sure that the bag of orts & gobbits stays inside when I’m packaging them. Thanks Joe. I rinse my chicken, I encourage everyone to do it because it equates to better flavor. I think Michael Ruhlman covered it well: http://ruhlman.com/2013/08/bacteria-run-away-run-away/.